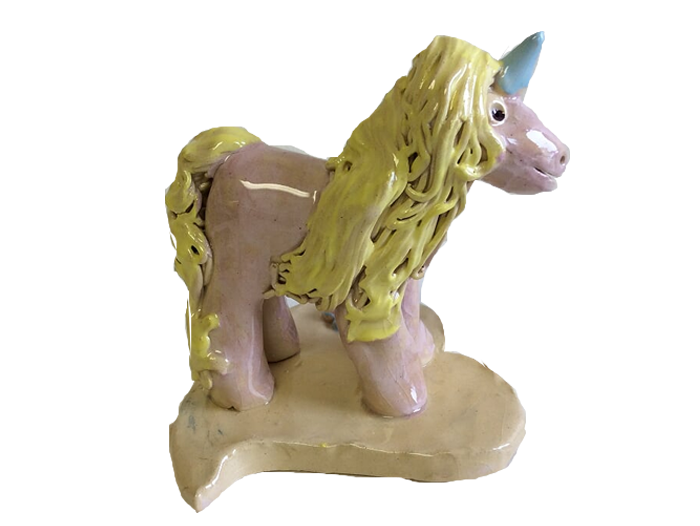 Clay for Kids Parties are great for kids, and adults too – a creative option for lady’s nights, office parties, private events, clubs and camps! Our instructors will travel to your location to offer one of our exclusive party programs. Gather your group of friends and choose from one of over 60 projects to create. On party day, your instructor will demonstrate on the pottery wheel and lead the party assisting and guiding artists to create the chosen project as each person adds their own creative touches to their art piece. For birthday parties, the guest of honor will have an opportunity to try their hand using our mobile pottery wheel! Projects are all taken for drying and firing, and returned within 21 days. Following clay building, artists will paint their projects with a special material that colors the clay before firing. Once fired, the clay will be dipped in clear glaze resulting in a shiny, colorful, finished piece of art! A great party option for adults, teens and children over 5 years! Turn bits and strips of specialty glass into twinkling kiln-fired treasures! We’ll show you and your guests how to create sparkling glass artwork, glittering glass jewelry, funky ornaments or sun catchers to hang in the window. Every piece is unique, the results are dazzling, and the fun is addictive! Choose from one of our designs or let your creativity run wild! Everyone loves working on the pottery wheel! Each artist will have an opportunity to create a bowl on the Clay for Kids pottery wheel under the guidance and supervision of our instructor. Colour will be added while the piece is spinning. The bowl will be dipped in clear glaze and fired at our workshop and the projects are returned with a hard, shiny, food safe finish. In addition to the wheel project, artists will each create a 5″x3″ fused glass project. This is one of our most popular parties for young artists. No need for loot bags as everyone will take their painted project home the day of the party. Our party specialist will arrive with all supplies, plastic table covers & aprons for everyone. On party day, your instructor will demonstrate on the pottery wheel and for birthday parties, the guest of honor will have an opportunity to try their hand using our mobile pottery wheel! There will be several bisque ware pieces for artists to choose from. After the pieces have been painted we will leave finishing gloss spray for spraying on the pieces once they are dry. Every piece can go home at the end of the party in Clay for Kids bag. Each artist will paint and sign a piece of bisque ware using authentic ceramic glaze. The projects are taken back to our workshop and fired in our kiln. Projects are returned within 21 days. CLAY BUILDING: 1 hr party. Acrylic paint for each participant included to finish project at home. $200 up to 10 participants. $20 per additional participant. For an additional $3.each, we will dip each piece into either, a green brown or blue glaze. The piece is returned with a hard shiny, colourful finish. CLAY BUILDING & GLAZING: 1.5 hr party. Slip glazing the project adds color to the piece resulting in a hard and shiny project. $250 up to 10 participants. $25 per additional participant. POTTERY BOOT CAMP + FUSED GLASS: 1.5 hr party. All participants make a bowl on the pottery wheel and glaze it and create a fused glass sun catcher. $192 up to 6 participants. $32 per additional participant, maximum of 4 additional. FUSED GLASS: 1 hr party. 5”x3” Sun Catcher. $20 per participant. Minimum 10. FUSED GLASS: 1 hr party. 4”x4” Sun Catcher. $25 per participant. Minimum 10. PAINT N GO PARTY: 75 minute party. All participants paint a prefired piece of bisque ware which can be taken home that day. $170 up to 10 participants. $15/ea additional participants, may require more time. We cannot guarantee all 10 projects can be the same. GLAZE PARTY: 1 hr party. All participants ceramic paint a piece of prefired bisque ware. All pieces are food safe. $200 up to 10 participants. $18/ea for additional participants, may require more time. 1. $100 deposit required at time of booking, full payment required before the event. 2. Refunds shall be granted before the party begins for an incapacitating medical hardship with a doctor’s note. Any approved refund will be granted minus a 15% processing fee. If we cancel a birthday party there will be a full refund. 3. The parent/guardian that is hosting the event must be present at all times during the party, also please remember parties cannot run over allotted times as your party person will be going to another event.